Earl Thomas was a no-show. Kam Chancellor was officially written off. 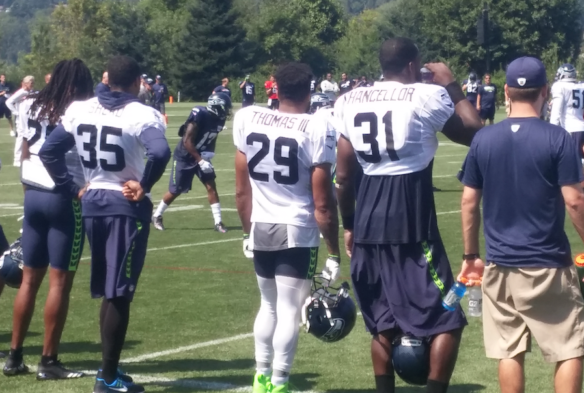 So Seahawks training camp began Thursday for the Legion of Whom. Bradley McDougald, you’re up. The Seahawks are stuck with the fact that most outsiders don’t care who is on the 2018 team, but rather who isn’t on the team. That’s because the Seahawks built a cacophony of big personalities and big talents that for several seasons were at the NFL’s epicenter. That circus has left town, more or less. Welcome to the Legion of Whom. Change was made official Thursday, when the Seahawks put SS Kam Chancellor on the reserve/physically unable to perform list, meaning he’s done for the season/career, and FS Earl Thomas failed to show up for the first day of training camp in Renton. Both developments were expected, but following the March dumping of CB Richard Sherman, we pause to note the formal deconstruction of the Football House of Slytherin and its peculiar dark wizards. Thomas could still return, because he has a year left on his contract. But now that he’s made good on the threat to hold out until his deal is extended, no one is expecting imminent improvement, including coach Pete Carroll. “We always expect him to be here,” he said, sounding a tad indignant after the first practice. “He should be here and he’s not. So it’s really about the guys that are here now and we are going to keep moving and grooving, and put it together. It’s unfortunate. Until Thomas walks through the door, the Seahawks will hold tryouts for the free safety job. The other vacancy, the replacement for Chancellor at strong safety, almost assuredly belongs to Bradley McDougald. Despite playing 675 snaps and getting nine starts last season, McDougald might be the most anonymous among the passel of players counted on to step up and keep the franchise from plunging into Browns-ness. He had 45 tackles, four deflections and was graded overall by Pro Football Focus at 77.3, considered average, and had a pass coverage grade of 85.9, considered high. After Chancellor went down with what became a career-ending neck injury, McDougald, a three-year starter for Tampa Bay who signed with Seattle in free agency, started and did well. The size difference (McDougald is 6-1 and 215) is significant when it comes to the violence with which Chancellor played. But it sounded as if Carroll accepts the absence of malice as a one-off unlikely to be replicated at the position. “For years, we’ve been coaching safeties based on their makeup and attributes,” he said. “We have so much (coaching) experience that we can do different things with different guys. McDougald is sufficiently versatile to play free safety, and sufficiently talented to have been invited by Thomas three weeks ago to work out at a safeties camp he hosted in Austin and attended by 10 other pros. Speaking of feelings, how was Thomas? “He was hoping the situation would take care of itself in time,” McDougald said. “We didn’t go too deep into it; it’s his personal business. Solving for Chancellor’s departure has been made by easier after re-signing McDougald before free agency began to a three-year deal worth up to $14 million. His return was one of the off-season’s top priorities. And at 27, McDougald also has advanced to something of an eminence. It borders on the astonishing to imagine almost-newbie McDougald among the venerable hands. But players have long claimed that NFL stands for Not For Long. The lamentable saga of DE Malik McDowell is over: The Seahawks waived their top 2017 draft choice Thursday without having played a down. An ATV accident in his home state of Michigan left him with a severe concussion, a development announced at the beginning of camp one year ago. Neither the Seahawks nor the McDowell family ever explained the circumstances, no police or hospital record of the episode has been disclosed, nor have the sides elaborated on the status of his bonus for a non-football injury. Carroll again was tight-lipped, but did acknowledge the huge cost. To make up for McDowell’s absence, the Seahawks traded WR Jermaine Kearse and a 2018 second round draft pick to the New York Jets to acquire DT Sheldon Richardson. He played well, but left in free agency, leaving a huge hole in Seahawks franchise assets. Scouts considered Michigan State’s McDowell, 20 at the time, a potential top-10 pick in terms of talent, but red flags about his maturity and motivation were abundant. That’s how he fell to the 35th pick, where the Seahawks took a gamble and lost big. I don’t claim it as original, but now it really fits. You recall well, although Wagner undoubtedly will object to No-Name. Kam and Earl were more than the sum of their parts. It was Terminator and his manic elf who often seemed to play faster than his established 4.3. The mental-emotional coordination they had will not be easy to find again and no amount of physicality can render it obsolete . . . True. A tremendous tandem that has no chance of replication. Jordan/Pippen. As my lede said, outsiders are focused on who isn’t here. I can see 8-8, and 9-7 if they get better heath forture than last year. Those roads are named for the two relatives not in jail.